Like so many aviation enthusiasts, Matteo Sanzani had dreamed since boyhood of becoming a fighter pilot. Matteo was born near an Italian Air Force Base and now lives near Modena (Italy). He caught the passion for aviation at an early age: a family friend was an Italian Air Force pilot. His first experience with military aircraft came during an airbase visit when he was 8 years old. As he said "I still remember the day like it was yesterday: I entered the cockpit of a G-91Y and my friend closed the glass over my head, a very exciting experience! From that moment all I wanted to do was become a fighter pilot, but soon I discovered that I was short-sighted”. That was unfortunatly the end of his dreams of flying jets. 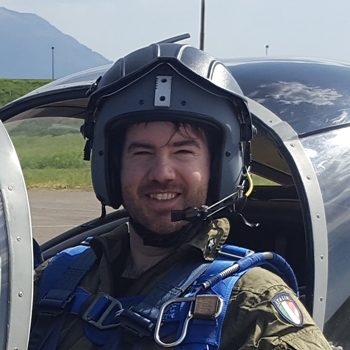 In 2011 Matteo founded Blog Before Flight, an aviation blog that in a few months has increased its success until becoming very popular (especially in the UK and US). Many newspaper have shared his posts that leading a lot of readers. Since then, many reports have been done with the armed forces around the world (Italy, USA, China, Thailand, Myanmar ...), many of them realized aboard military aircraft. Today Matteo can finally say that his job is to fly.